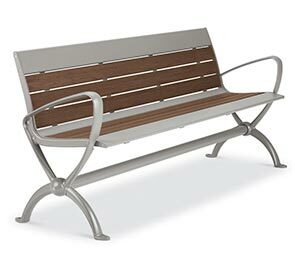 Add a sense of excitement to public seating and facility aesthetics with Beacon Hill Series contour recycled plastic benches. The eloquently crafted benches have a modern one-piece, contoured seat composed of 1" x 4" recycled plastic lumber and aluminum accent planks. 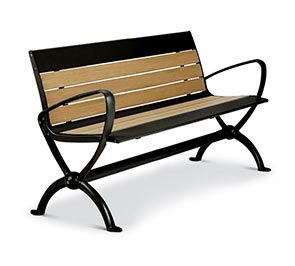 The powder-coated cast iron frame supports the 4' or 6' bench seat and features ergonomically sleek attached armrests. Built ready to accommodate a variety of environments with the eloquent blend of comfort, strength and beauty offered by Beacon Hill Recycled Plastic Series.